At the European Spaceport, we are less than a week away from the next launch. 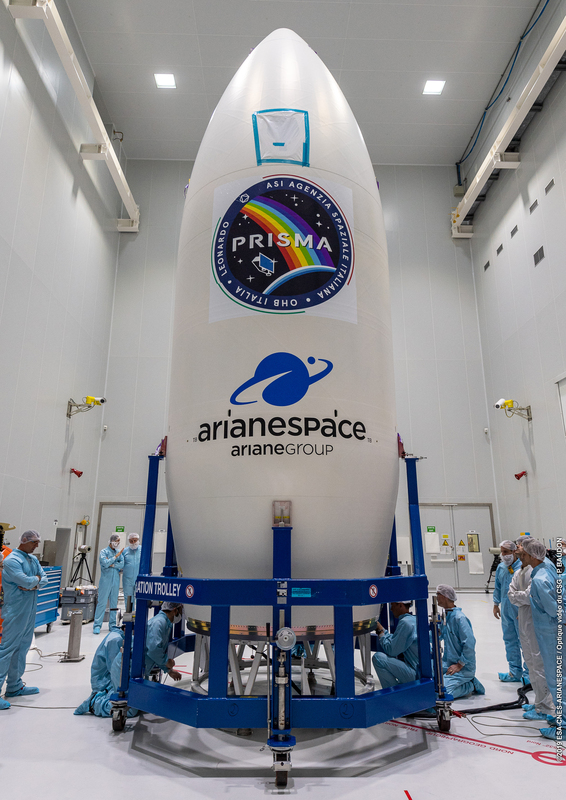 This is Vega launch number 14, flight name VV14, which will be carrying the Italian satellite PRISMA. The satellite is equipped with an innovative instrument: a multi-wavelength sensor combined with a medium-resolution camera, which it will use to monitor our planet, aiding scientists studying things such as pollution control and crop classification. On February 26th (that is, the day before the Soyuz launch number VS21 of the OneWeb satellite constellation), our technicians completed the installation of the fairing. The next day, on February 27th, the satellite under the fairing was installed on the vehicle that takes it to the launch pad. And the next day, February 28th, the entire structure was transferred to the Vega launch site and installed. The launch is scheduled for March 14th. As always, you can watch our launches live on Arianespace’s website, and you can follow ESA Space Transportations on Twitter for updates.